Bedias Baptist Church Jesus is Lord! Welcome to Bedias Baptist Church! 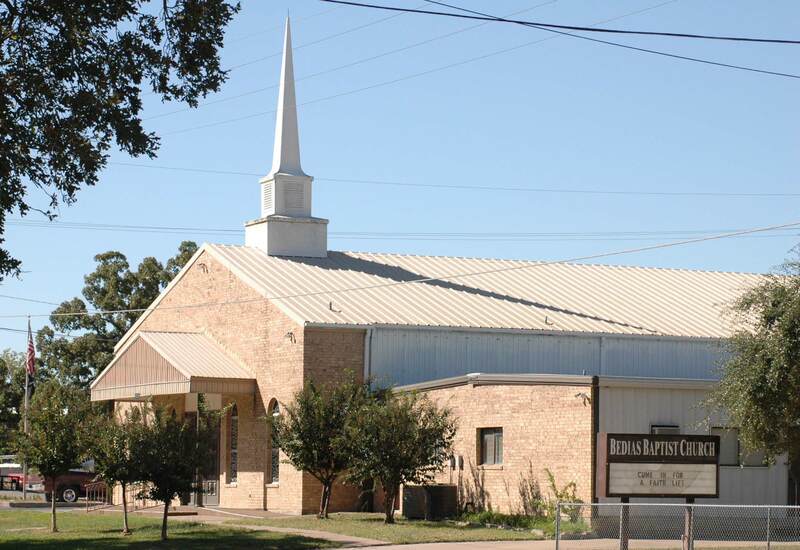 Bedias Baptist Church was established in the eighteen hundreds. The church has grown and God has blessed in every way. Today the church is made up of many people from every walk of life. However, when we come together to worship our God, we become the one body that He intends His church to be, we become a family lifting up the name of Jesus. We meet on Sundays in our worship center, where we can comfortably seat you and your family. We have a wonderful new gym for recreation and fantastic kitchen facilities where we prepare meals for special events. Our nursery facilities are modern and up to date with a more than adequate staff to care for your most special family members. Our children’s education areas are nice, our youth facilities are great, we have adult education for all ages and we have plenty of parking within a short distance to entrances of our facilities. You should come and see for yourself this Sunday! We can’t wait to see what God will do next! Bedias Baptist Church is a vibrant body of believers with contemporary and traditional music, and preaching that is applicable to you and your family right now. Located in Grimes County in downtown Bedias, Texas. We pray you will find a home for your family! Come see us this Sunday or Wednesday and see for yourself. It has been said, “Seeing is believing.” So come, see and believe.